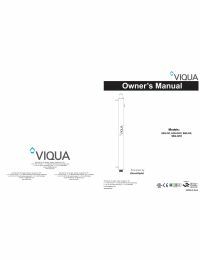 The Viqua S2Q-OZ System is made specifically for hot tub and spa applications. The S2Q-OZ is an air venturi disinfection system that is low maintenance and is easily serviced. * For any necessary lamp replacements, the S15ROL UV Lamp is compatible with the S2Q-OZ system. ** 230V systems are shipped with 2-prong continental European (CEE-7/7) 2 pin with ground "Schuko" power cord.